With 1200+ happy clients and 2500+ successful engagements, Imaginet's certified SharePoint Consulting Services team has helped organizations collaborate more effectively for almost 20 years. With the incredible power and flexibility of Microsoft SharePoint comes complexity and the need to work with a Microsoft Gold Partner like Imaginet who has a proven track record of success. Ready to deploy, upgrade, or migrate Microsoft SharePoint, but not sure where to start? Imaginet’s SharePoint Consulting Services team can help you rapidly assess and plan how to take advantage of all the features and benefits of Microsoft SharePoint Server and SharePoint Online. Let Imaginet’s certified SharePoint consultants bring your SharePoint to life with deployment, migration, development, and application integration services. Gain productivity and peace of mind by letting Imaginet manage and sustain your SharePoint environments for you. Our SharePoint Consulting Services team can help you avoid unplanned downtime and provide you with the operational excellence you need to keep your operational costs under control. Imaginet's SharePoint Consulting Services team has helped some of the largest companies around the globe with all of their SharePoint needs. Read about our solutions to some of our customers biggest SharePoint challenges. See for Yourself. Be Amazed. 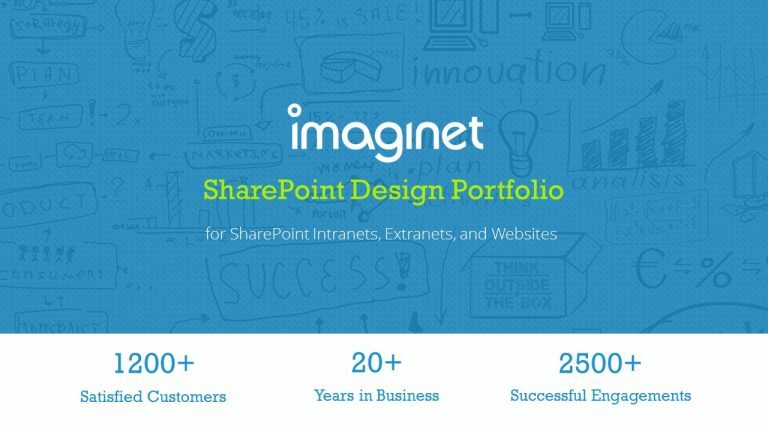 Download Imaginet's SharePoint Design Portfolio to see various samples of our innovative and creative user experience and design work across a multitude of industries and organization types. SharePoint consulting services offered worldwide.